So you’re eager to get your hands dirty on Microsoft latest OS, maybe you already have. As techies we always intend to be on virtual PC’s to test the latest stuff and learn new settings and tweaks. Windows server 2008 has more to offer in this area. 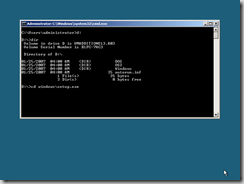 Windows core is pretty interesting method of using the windows server OS. 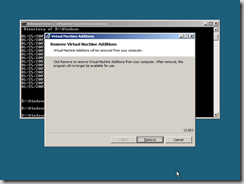 One problem I came across with server Core is how to install the virtual machine addins to it. I’m using Microsoft virtual PC 2007 and after the initial OS setup I ran the virtual PC addins from the actions menu. Well it suppose to star the installation automatically right… well too bad it didn’t happen. I hope you folks are well aware why we need the virtual addins to the virtual PC. Basically they are emulated drivers which enhance the response in the virtual machine and communication between the guest and the host PC. So in order to install the addins you need to mount the cd / iso image to virtual PC. Under action menu when you click install the virtual PC addins it automatically mounts the iso image to the cd-rom in the virtual PC. To verify that you can click the CD icon in the menu and see if you have the option Release "VMaddtions.iso" So rest we carry out in the command prompt. In my case the cd rom drive letter is D. If you have more than one virtual HDD installed then the drive letter can be different. 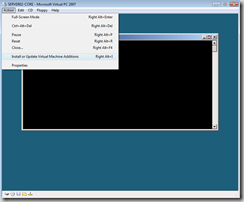 Never the less you can browse the virtual CD and then get into the windows folder and then run the Setup.exe Once that start you’ll able the see the GUI installation of the virtual machine addition setup. In the above picture I have been prompted to remove the addins since I have already installed them earlier. But I hope you guys get the point. experienced network /connection problems to the server. At least once a day I must reboot the server so that users can access the shared folders in the server. Since I host a database in this machine this problem has become a real headache and a panic to me. Users with offline files get notice that they are no longer connected to the server. They can’t sync etc. When this happens you can still ping the server. Remote desktop to the server works 100% and the server seems to be working without any error.Tested the cabling and all the links passed the tests. Apart from that Microsoft has acknowledged this problem can occur if you’re having outdated NIC driver. After removing the AV software users back to business. I guess I’ll have to test out the latest version of the Symantec (MR3) and then see if that solved the problem. Will update you all once I get my hands into SEP MR3 version.